Follow these four tips to make sure you are prepared—financially—for baby's arrival. It's a vitally important part of parenting but not terribly pleasant: making sure you and your family will be taken care of financially, no matter what happens. Health coverage should be an absolute priority. to keep premiums manageable and still protect yourself against a catastrophe, get a plan with a high deductible—$5,000 or more—through your employer or as an individual. Most new parents don't realize that their odds of losing their source of income because of disability are far greater than dying young. Be sure you're covered for short- and long-term impairments. As for how much life insurance coverage to get, St. Louis financial planner Chad Slagle recommends this breakdown: "Add up all your debt—autos, house, credit cards, student loans—and calculate how much of an insurance payoff would eliminate that debt, and give you enough interest income to cover your expenses while staying home to take care of your family." Find an attorney who specializes in estate planning and ask about a revocable living trust. 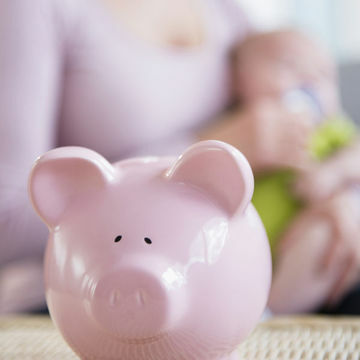 "You need to start thinking about whom you trust to take care of your kids and who will best manage the finances— and those aren't necessarily the same person," says Slagle. Sure, it's pretty far off, but it's a good idea to start small now, experts say. Scott Hipp, a certified financial planner based in Overland park, Kan., recommends trying something realistic, such as 5 percent of your salary. Also, check out 529 plans in your state: Like a 401(k), you contribute to a pool of mutual funds and the money grows tax-free, provided you use the proceeds for higher education.